In addition to the residential Protection Island, Nanaimo’s harbour boasts a second island, Newcastle Island, which is a gorgeous marine provincial park. Newcastle Island is quite a bit bigger than Protection Island and it offers 22 km of trails suitable for walking, hiking, and/or biking through the rainforest and along the coastline. A walk-in campsite is also on site, as are several group campsites that are well used by school, scouts, and other such groups. Docks and mooring buoys serve boaters. The Q’uluc’tun Bistro serves burgers, ice cream , etc. during the summer season. Kids enjoy giant chess and a playground, as well as numerous beaches including a couple sandy ones. Newcastle Island has a rich and fascinating history. For thousands of years, it was a significant spot for the Snuneymuxw First Nation who valued it for food gathering (clams, oysters, crabs, fish, berries, etc.) and as a sacred place for spiritual training. There were two villages on the island and even today it is possible to see their shell middens. The Snuneymuxw had many names for different parts of the island, according to their features, and they continue to have many traditional stories about the island. In the 1800s, colonialists arrived in the area. The island was used for a while as a smallpox quarantine location. Then in 1849 coal was discovered by the Hudson’s Bay Company (with information from a local Snuneymuxw man later named Coal Tyee) and in 1852 the first of two coal mines opened. Coal was mined from the Newcastle Mine between 1853–56 and from the Fitzwilliam Mine from 1872–82. A sandstone quarry operated from 1869 to 1932, and the pulp-stone industry profited from Newcastle’s sandstone from 1923 to 1932. From the early 1900s to 1941, a number of herring and salmon salteries operated on the island, and, from 1918, the Nanaimo Shipyards Ltd. offered shipbuilding and repair. All of the latter was taken from the Japanese-Canadian owners in 1941. 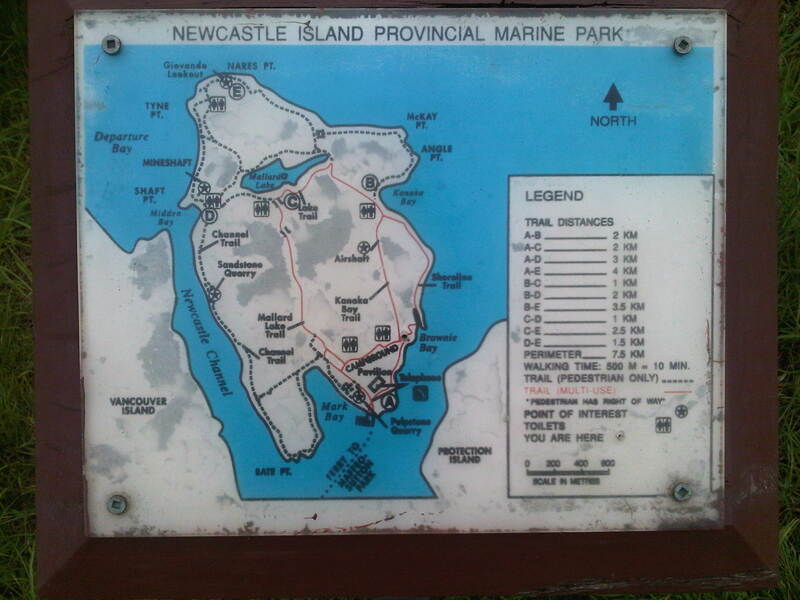 In In 1931 the Canadian Pacific Railway bought Newcastle Island and turned it into a successful resort for visitors brought in by boat from Vancouver. The main attractions were the pavilion with its spring dance floor and soda fountain, as well as the beach and picnic areas. The pavilion is still in use today, and is a prime spot for local wedding receptions. The resort was compelled to close during World War II because the ships were needed for battle. The City of Nanaimo purchased the island in 1955 and sold it for $1 to the province in 1959 under condition that it become a provincial park – which it is to this day. Remnants of all this history can be seen as you walk around Newcastle Island. To get to Newcastle Island from Nanaimo, there is a dedicated foot passenger ferry service that leaves from Nanaimo’s Maffeo Sutton Park. That ferry service will drop visitors off at the Dinghy Dock Pub on Protection Island after their visit on Newcastle. For information and schedule, see Newcastle Island’s website. Visitors to Protection Island can walk to Newcastle Island at very low tides – a wonderful adventure!